The Delaware City Schools Board of Education approved an expansion to the transportation center, staffing changes, as well as numerous contracts with special education services during its Monday meeting. Jason Sherman, the district’s director of facilities and transportation, spoke to the board at the meeting and detailed the proposed addition at the transportation center, located on Liberty Road. Sherman said the $429,722 addition will add an additional room to be a training area and will enclose the wash bay. Sherman said the budget for the project was a little lower originally, but said the increased price is reflective of the construction industry. 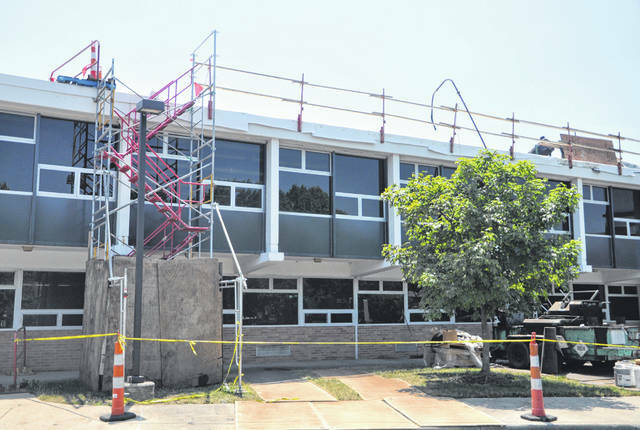 Sherman added that over the summer, the roof at Hayes High School will be improved, and a film has been installed on glass at Hayes and Dempsey Middle School. Sherman said the glass is shatterproof and will increase security at the schools. Additionally, Sherman said the district will be replacing the broken seats at the auditorium at Willis Education Center. “That’ll be an exciting way to give a shot to the arm to some needed improvements in that auditorium and a huge step towards making that a much better community space,” Sherman said. Assistant Superintendent Heidi Kegley said the auditorium is used by students throughout the school year for speakers and author visits. The board approved two resignations: Heather Smith, a guidance counselor at Hayes High School, and Matthew Lewis, a bus driver with the district. BOE members approved a number of employments, including Danielle Allen, who would be an intervention specialist at Conger Elementary; Leslie Cellar, who would be a guidance counselor at Hayes; Jennifer Clark, for an intervention specialist position at Carlisle Elementary and Schultz Elementary; Emily Hubbard, who would work as a first-grade teacher at Conger; Barbara Knoll, a kindergarten teacher at Carlisle; and Krystal Spurlock, who would work as an intervention specialist and in the cross-categorical room at Dempsey Middle School. Additionally, the board approved the hiring of a number of classified staff, including Sarah Bowman, a cook/cashier at Dempsey; Allison Carr, an educational assistant at Hayes; Tammy Fett, a three-hour custodian at Hayes; Charlotte Moorman, a second-shift custodian at Carlisle; Laura Pennington, an educational assistant at Woodward Elementary; and Nikki Smith, an administrative assistant at Carlisle. The board also approved seven contracts with special education services. The approved contracts were two contracts with Step-By-Step Academy/Boundless; a contract with V.I.P. Rehabilitation Services L.L.C. ; a contract with Progressus Therapy; a contract with ABC Therapies, Inc; a contract with Columbus Speech and Hearing; and a contract with Delaware Speech and Hearing. The board the approved nearly 100 supplemental contracts for the 2018-2019 school, which include coaching positions, department chairs and club advisors. BOE members also approved a salary increase for School Aged Child Care (SACC) employees effective at the beginning of the first full pay period of the 2018-2019 school year and approved a three-year Ohio Association of Public School Employees (OAPSE) collective bargaining agreement. The board will meet again on Aug. 6 at 6 p.m. in the board room at Willis. This entry was tagged delaware city schools board. Bookmark the permalink.